— This article by Jerry Cates, first published on 6 April 2010, was last revised on 24 April 2016. © Bugsinthenews Vol. 11:04(04). Etymology: [the prefix a (negation) + the Greek word γλύφω (glypho) “a carved work” + the suffix ous, to signify a state of being = “teeth which are not carved”]. The expression is a reference to teeth that are neither hollow nor grooved, i.e., that are solid, generally of the same size, which are not used directly for injecting venom. Of the nearly 3,000 recognized species of snakes worldwide, the vast manority–perhaps as much as 85% or more of the total–are aglyphous and, by many conventional definitions, non-venomous. In fact, most snakes in the Colubridae family–the largest ophidian family of all–are aglyphous. The colubrid rat snake depicted at left, for example, has numerous small, solid teeth that are used to grasp and hold struggling prey while capturing and later, in the act of swallowing that prey. Similarly, pythons, boa constrictors, and anacondas, many of whom become, at maturity, huge serpents with mouthfuls of solid teeth, are purely aglyphous in their dentition. Such snakes, by definition, have no grooved or hollow teeth, nor do they possess specialized venom glands, venom storage lumens, or any kind of anatomical venom-delivery apparatus. Until recently (as early as the 1920’s, according to the reckoning of some, and as late as the 1950’s according to others) they were not believed to possess even so much as modified Duvernow’s glands, or analogous structures, capable of producing toxic salivary secretions. Today, some doubt has been cast on that belief, and on-going research is plumbing the depths of all the issues involved. Even in the case of an aglyphous serpent that is, by all known measures, entirely non-venomous, the bites they produce are not always harmless. A large snake with aglyphous dentition can inflict a bite that is both painful and bloody, as a result of the puncture wounds caused by its many solid teeth. Strong jaws, and muscular necks and bodies capable of ripping flesh, can wreak havoc of monumental proportions under the right circumstances. And, of course–though such is not the subject of this paper–many serpents with purely aglyphous dentition are capable of harming and even killing large animals, including man, with their powerful constricting coils. Eastern Hog-nosed Snake (Heterodon platirhinos), a common Norh American snake species with opisthoglyphous dentition. Etymology: [From the Greek words όπισθεν (opisthen), “in the rear” + γλύφω (glypho) “a carved work” + the suffix ous, to signify a state of being = “grooved teeth in the rear (of the mouth)”]. The expression refers to rear-facing fangs, positioned in the back of the snake’s oral cavity. Certain snakes possess opisthoglyphous, that is, grooved, rear-facing, elongate, fangs, that are positioned at the backs of their mouths. Such snakes typically have a mildly toxic saliva that serves as a weak venom, mostly to anesthetize their prey so that they can be subdued and ingested more easily. Though all North American opisthoglyphous snakes are considered to have salivary secretions that are not dangerous to man, records exist of bites from such serpents that have produced swollen wounds that remained painful for several days. Outside of North America, the saliva of certain opisthoglyphous snakes is not necessarily mild. For example, two celebrated herpetologists, Dr. Robert Mertens, and Dr. Karl Patterson Schmidt, were fatally envenomated by opisthoglyphous snakes. Mertens (1894 – 1975), was born in Saint Petersburg, Russia and moved to Germany in his youth where, at the University of Leipzig, he earned a PhD in zoology in 1916. Over the ensuing fifty-nine years he authored several books on zoology, lectured on reptiles, and became widely recognized as an authority on reptiles. He died after being bitten while feeding his pet, a savanna twig snake (Thelotornis capensis). The African twig snakes are distinctive in appearance, and prey on lizards, frogs and sometimes birds by concealing themselves in trees, usually at a low enough level to be able to also strike at terrestrial prey. Their coloration is cryptic and they exhibit an ability to freeze or gently sway, like a twig, in such a manner as to make them difficult to see in the wild. Their saliva, unlike that of the eastern hog-nosed snake, is strongly venomous, but Mertens, on being bitten, assumed he had not received enough of a dose to worry about. He was mistaken, and died after failing to seek medical assistance before the effects of the envenomation had progressed to the point of fatal organ damage. Wolfgang Wickler named Mertensian mimicry in honor of Dr. Mertens. Schmidt (1890 – 1957), was born in Lake Forest, Illinois. In 1913, he entered Cornell University to study biology and geology, but soon developed a serious interest in herpetology. From 1916 to 1922, he served as scientific assistant in herpetology at the American Museum of Natural History in New York, under Mary Cynthia Dickerson and Gladwyn K. Noble. His first collecting expedition took place in Puerto Rico in 1919. In 1922 he became the assistant curator of reptiles and amphibians at the Field Museum of Natural History in Chicago. From 1923 to 1934, he made several collecting expeditions for that museum to Central and South America, which took him to Honduras, Brazil, and Guatemala. From 1937 to 1949, he served as editor of Copeia, a renowned journal of herpetology and ichthyology. He also was appointed as the chief curator of zoology at the Field Museum in 1941, and continued in that capacity until his retirement in 1955. From 1942 to 1946, he was the president of the American Society of Ichthyologists and Herpetologists (ASIH). His last expedition, to Israel, took place in 1953. His death in 1957 followed a bite from a juvenile boomslang snake that Marlin Perkins, then director of the Lincoln Park Zoo (later made famous for hosting the televised nature series Wild Kingdom), had sent to his lab at the Field Museum in Chicago for identification. Schmidt underestimated the severity of the snakebite and, as a result, did not seek medical treatment until it was too late to counteract the effects of the boomslang’s venom. 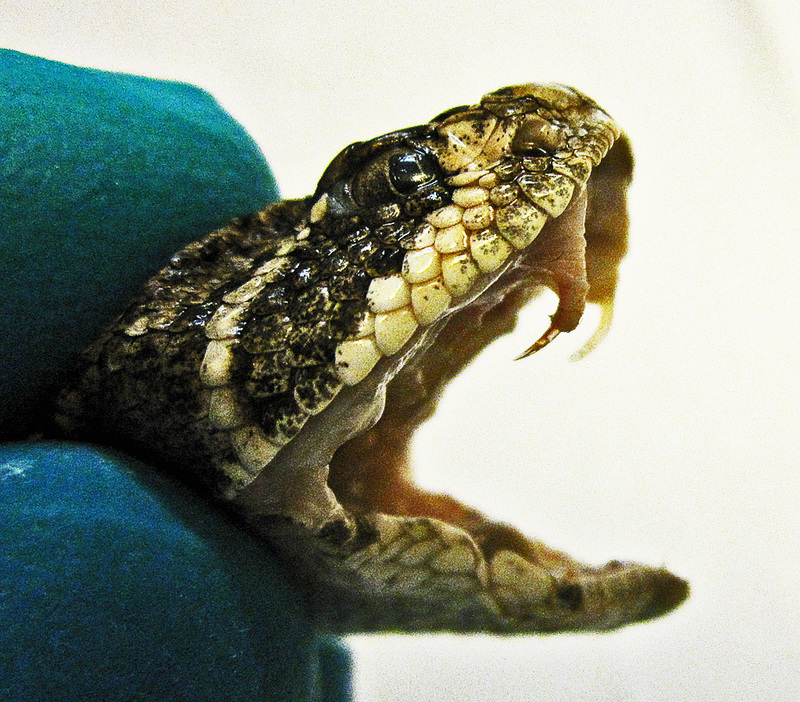 The bite took his life 28 hours after envenomation. The boomslang (Dispholidus typus) is now the only species in the genus Dispholidus, though — in earlier times — the genus included several species and subspecies that have since been relocated to other taxa. The common name, boomslang, means “tree snake” in Afrikaans and Dutch. Boom, a cognate of “beam”, translates to “tree,” and slang translates to “snake”. Its large eyes are positioned in an egg-shaped head distinctly offset from the neck, on a body whose coloration is highly variable. Males are light green with black or blue scale edges, but adult females may be brown. Seven or eight anterior maxillary teeth are followed by three large, grooved fangs under each eye. The boomslang is restricted to sub-Saharan Africa. Fortunately, by comparison with that of the African twig snakes and the boomslang, the venom of the eastern hog-nosed snake — while mildly toxic — is not considered dangerous. The rear-facing (opisthoglyphous) fangs of these snakes, besides serving to assist in delivering toxic salivary secretions to the wound site, often function to puncture the inflated bodies of toads, snakes, and other prey. Such prey pressurize their lungs and ancillary air sacs as a defensive measure that makes it more difficult to swallow them. Texas Coral snake killing a rough earth snake: The Texas Coral Snake, a member of the Elapidae family, has proteroglyphous dentition and a highly toxic venom. 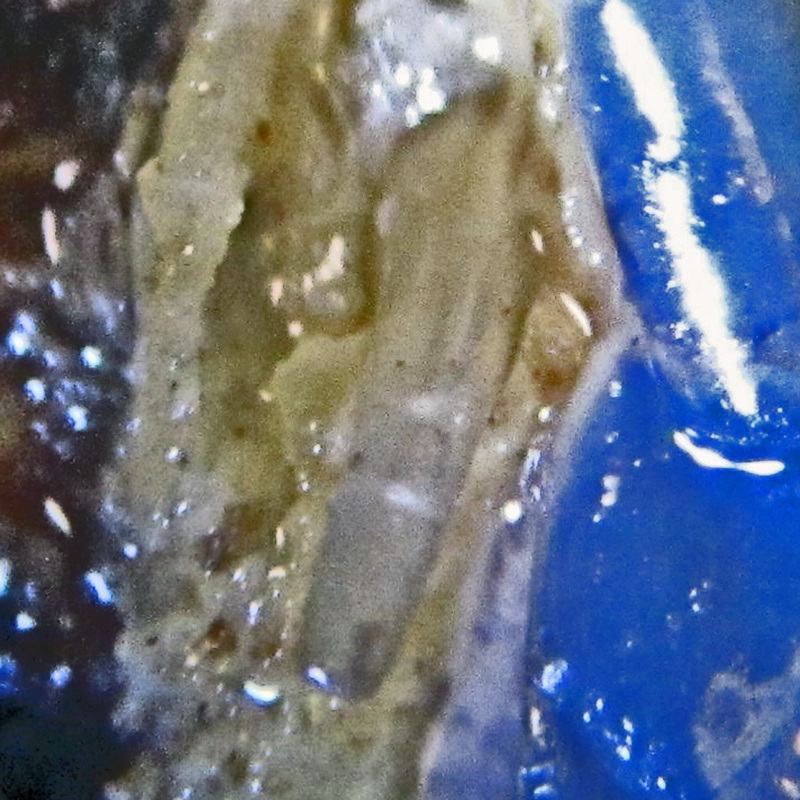 Texas Coral Snake (Micrurus fulvius tener); Austin, Texas, 2008–Micrograph of fang, ventral view. Note that the fang is constructed as a hollow straw, and the tip of the fang is blunt, like that of the tip of a drinking straw. An air bubble can be seen about one-third the length of the fang, from the tip. Etymology: From the Greek words πρώτο (proto) “forward” + γλύφω (glypho) “a carved work” + the suffix ous, to signify a state of being = “grooved teeth that are positioned forward, or anteriorly (in the mouth)”]. The expression refers to fixed, grooved teeth in the front portion of the snake’s oral cavity. Proteroglyphous snakes have maxillae that are, by comparison with many other snakes, shortened in their longitudinal spans. These abbreviated maxillae bear relatively few teeth, with the exception of an enlarged, fixed fang, near the anterior extension of the maxilla, that points downward. The structure of this fang folds around a venom channel, forming a hollow needle through which venom flows from the snake’s venom glands into the flesh of its prey. These snakes do not possess complicated musculature to contract the venom reservoir. Thus–rather than being forcefully injected–the venom flows under weak pressure into the wound. In order for sufficient venom to be applied, the snake must maintain a grip on its prey, at least momentarily. In most other snakes such a tactic would be highly dangerous to the predator, but the venom of proteroglyphous snakes–reputed among the most toxic of all ophidian venoms–is not only highly toxic. but fast acting as well, and capable of subduing most prey almost instantly. 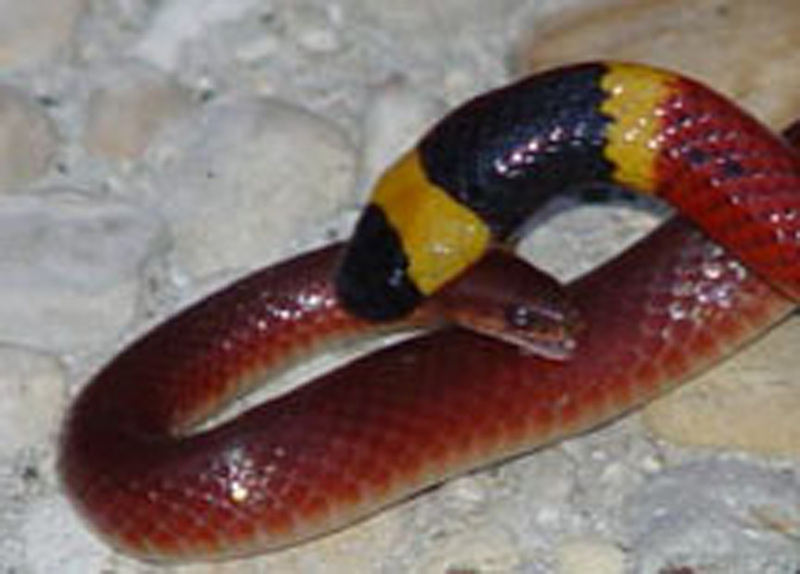 Because of the structure of the coral snake’s fang, and the lack of a robust musculature to contract the venom reservoir, some have suggested that the risk of envenomation from coral snakes is reduced over that of pit vipers. This is not the case. It is not true that a coral snake must chew on its victim for some time before venom is injected. Any bite by a coral snake must be taken seriously by immediately seeking medical assistance at a medical facility that either has, or is able to quickly obtain, coral snake antivenin. This advice applies even if the snake only grasps the bitten individual momentarily, and even if, for some time after the bite, the bitten individual shows no signs of envenomation. 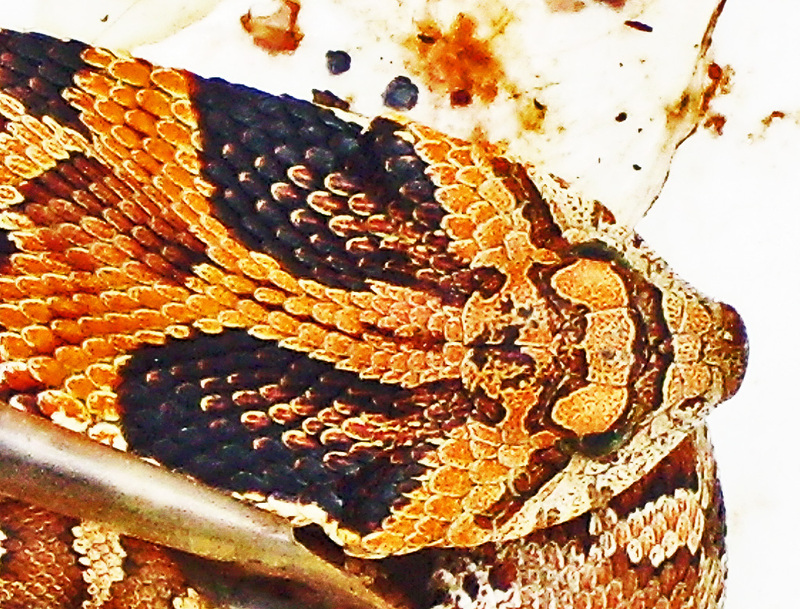 Western Diamond-backed Rattlesnake (Crotalus atrox); Karen L., Cedar Creek, TX, Micrograph of fang tip–10.22.2010. Unlike the fang of a coral snake, that of pit vipers has a sharp, pointed tip. 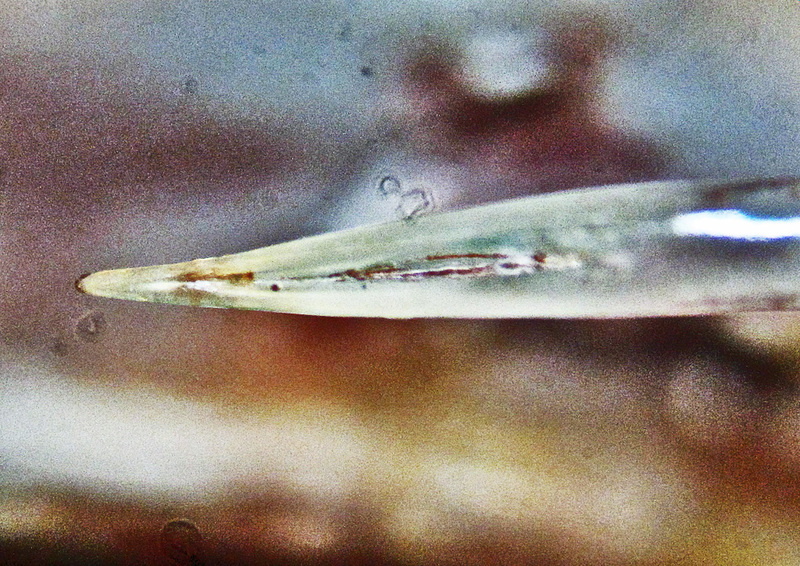 The venom is ejected from an orifice some distance from the tip (the elliptical opening shown midway from the tip to the portion of the fang visible in the image). Etymology: [From the Greek words σωλήνας (solenas) “tube” + γλύφω (glypho) “a carved work” + the suffix ous, to signify a state of being = “One whose teeth are in the form of a tube or a pipe”]. The reference is to hollow, moveable (folding) fangs, positioned forward in the snake’s oral cavity, which serve as efficient venom injection devices. Snakes with solenoglyphous dentition have long been thought the most highly evolved of all our serpents. Molecular genetic analyses have lately added credence to this belief. Their maxillae are much reduced, even in comparison to proteoglyphous snakes. Moveable fangs, often as long as half the length of the head itself, fold back and upward, against the roof of the mouth when the snake is at rest. 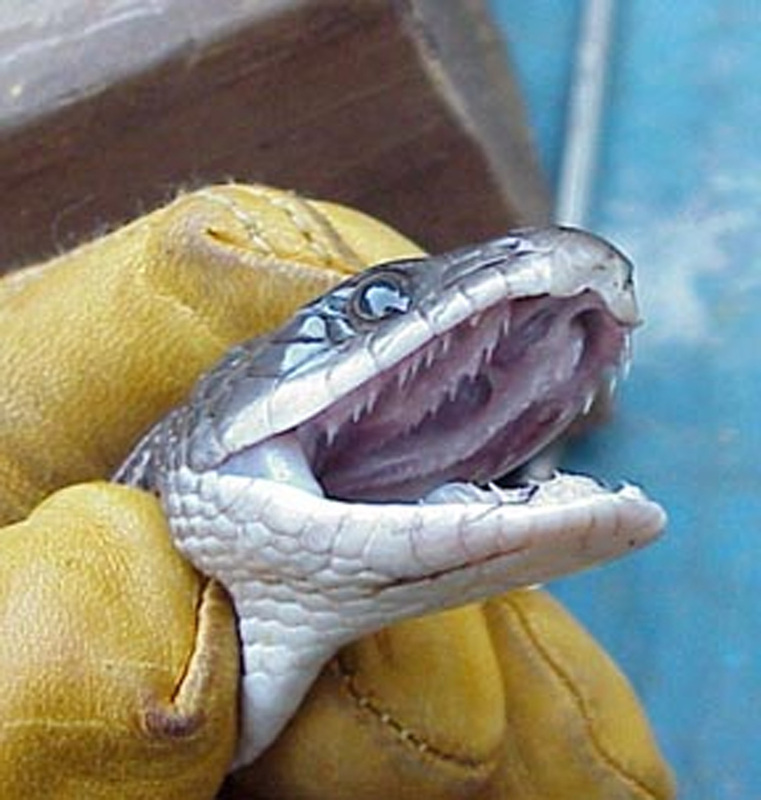 When threatened, or when preparing to envenomate prey, the snake opens its mouth, erects its fangs outward, then strikes, pressing its extended fangs into the prey’s flesh and simultaneously injecting–under considerable pressure–venom from storage reservoirs in the head and neck into the prey’s body. The mouths of solenoglyphous snakes are generally capable of opening nearly 180 degrees from their closed positions. Though their venom is typically much less toxic than that of proteroglyphous serpents, the are possessed of large venom storage lumens, and extensive compression musculature that, in combination, enable the snake to inject large quantities of venom in the span of mere milliseconds. Most bites from solenoglyphous snakes occur so quickly that the target does not realize for a moment that they have been envenomated. North American Snake Markings & Coloration Guide. Snake Anatomy, Physiology, and Taxonomy. Snake Exclusion — How to Snake-proof your Yard and Home. Snake Repellents — How, and How Well, do They Work? What is Meant by “A Reasonably Snake-Free Environment”? — Questions? Corrections? Comments? BUG ME RIGHT NOW! Feel free to e-mail jerry.cates@bugsinthenews.info. You may also leave a comment in the space provided below.